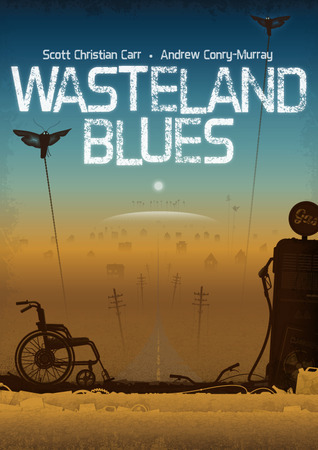 The only thing I didn’t enjoy about “Wasteland Blues” is that it ended, just as my interest continued to grow and grow. ‘Leave them wanting more’ I guess is the phrase that Carr &Conry-Murray are putting into practice here. And honestly this sort of surprised me from where I came from starting this novel.Reading the opening chapters my response was rather luke-warm, the post-apocalyptic situation seemed so very familiar, and the plot seemed pointed squarely onto a simple quest with cut-out characters, which ranged from crass to dim to impotent. I knew ‘apocalyptic’ was a genre of story I adore, and even something run-of-the-mill could provide some entertainment, but I was eagerly looking for something more, something that set this apart. Joyously, the book grew on me quickly, the characters turning deeper than I expected, the plot turning inward and becoming more about the journey and its diversions than that bright far-off quest goal, and intriguing elements introduced that aren’t simple post-apocalyptic tropes. This turnaround in my response is a testament to how well this novel is plotted. With Carr’s background in TV, this strength is understandable in hindsight. The novel unfolds as if it is on the screen, drawing the reader into this world bit by bit, making us start out curious, hating the characters one moment, only to find some part of them that draws our sympathy instead the next. Each character is clearly a ‘type’, yet the majority of them are rounded enough to show struggles and depth, hints of what made them act the way they are, and that perhaps there is more to them beneath the exteriors they parade. As the core cast of characters continue their journey new faces are introduced, each more fascinating than the next, adding further dynamics and threads to the tale. In terms of style the writing reminded me most of Stephen King, with its moments of humor, absurdity, rage, and general off-kilter characters. Despite being written by two men, the novel maintains a unified voice, and I can see how (as the introduction posits) the two authors complement one another to reach a fine balance in tone. At first, despite the post-apocalyptic setting, the story appeared to have more elements of fantasy to it than science fiction. This feeling in style occurs easily in the genre what with humanity often being pushed back in terms of civilization and technology due to the ‘Collapse’, ‘Devastation’, ‘War’, etc. But again, it is as if the authors were delighting in throwing the reader off-balance, for elements of science fiction and technology entered into the story in the latter portion of the novel, in unique and intriguing ways, leaving one to wonder what additional surprises may be in store with any future visits to this universe. These portions of the story may come from the influence of Conry-Murray, but regardless of the source, they make for a well-appreciated infusion of science and technology into a wilderness tale. Which brings me to the downside to this novel, the end. As the pages remaining grew few, I realized that there was no way the plot would be able to wrap up in the sense that their quest, their journey could not possible conclude. Why end the novel now, after one diversionary episode in this grand adventure? Why now, rather than the previous one…or the next? Simply enthralled with the ways the story was going I didn’t want the ride to end, and forgot for a moment that there is more to “Wasteland Blues” then the simple quest plot and its initial set up of simple characters. The diverse characters, each very separate individuals, after their own personal goals, were now at this point an actual family of sorts, an actual traveling group with goals more in common than they may have originally suspected. The most twisted and volatile character has had moments of genuine reflection and calm. They have grown into something, and in a sense, it makes perfect sense for this segment of their overall journey to end at this point where they have reached something substantial, maybe not in plot, but in their own personal characters. “Wasteland” isn’t fine literature, it isn’t some staggeringly insightful commentary couched within a post-apocalyptic symbol. But it is a solid and engaging journey of reading in the genre, with a bit of depth, some interesting innovations, good laughs, and a ton of heart.